Although I would prefer to give a raw food diet, with raw meaty bones, some raw meat and offal, and raw vegetables, what I am wanting to do is suit the diet to each individual hound's needs. This is based on the same precepts as the Metabolic Typing Diet of William Wolcott and others in the field of human nutrition, which came about because of the obvious truth that what suits one person may not suit another and may even have a detrimental effect on a third. This is just as true of dogs, and the ever widening range of chronic disorders that we are encountering in our companion animals is one result of the insistence that all dogs require the same sort of basic diet. The Metabolic Type of each individual encompasses far more than what we know of as metabolic rate (that is, the rate at which we burn energy) and includes a number of other known functions and very probably others that are not yet known. The known functions are what William Wolcott refers to in his book, The Metabolic Typing Diet, as fundamental homeostatic control mechanisms, which all involve the body keeping a balance between two opposites. These mechanisms include the oxidative system, which is the conversion of energy at a cellular level; the autonomic nervous system (sympathetic and parasympathetic, which regulates the metabolism); the catabolic/anabolic balance which governs oxygen metabolism at a cellular level; the endocrine system, and how each endocrine gland is balanced with regard to the other glands in the system; the acid/alkaline balance, which governs the pH levels throughout the body; the prostaglandin balance, which regulates inflammatory and immune responses; and the electrolyte balance which regulates circulation and osmotic pressure. Besides these homeostatic mechanisms, there are rhythmic cycles of the body and within the body, which also need to be in balance with each other. These include the Circadian rhythm, the rate at which the heart beats, the breathing rate, the rate of blood pressure, and so on. This is another area where there are undoubtedly rhythms of which we are ignorant. Since basically the body is made up of energy vibrating, there is the rhythm of that vibration; the rate of pulsation of energy throughout the body, and the rate of flow of energy and whether there are blockages to that flow. What it actually comes down to, though, is giving each body what that body can use as fuel and this is going to differ from individual to individual. All will require the basics of protein, for example, but what kinds of protein and how much will differ from animal to animal. It's probably simplest to see the difference in Metabolic Types as a scale (as shown in William Wolcott's book), with the Carbo Type at one end and the Protein Type at the other, with every individual falling somewhere in between. The Carbo Type requires low energy proteins such as chicken breast, turkey breast, lean pork, or white fish; while the Protein Type requires higher energy proteins such as rabbit, the dark meat of poultry, red meat such as beef or lamb, organ meat such as tripe and kidneys, and coloured fish such as salmon or dark tuna. There are also protein sources which are particularly high in energy, such as sardines, herrings, liver, and heart, and Protein Types require differing amounts of these foods. Some might require them only occasionally, some several times a week, and others every day. Animals that came under the Carbo Type heading, or had a leaning towards that end of the scale, would not do well on these high energy protein sources even if they were only given occasionally. This would also possibly be the case for those animals that came somewhere on the scale between these two opposite Types. These are usually called "Mixed Types" and can be close to either the Carbo or Protein Types or anywhere in between. The amounts of carbohydrates each animal requires will also differ. Carbohydrates are any plant-based food, such as vegetables, fruit, and grains. Carbohydrates contain different amounts of starch, some (leafy greens such as lettuce, cabbage and spinach but also green beans, and flower type foods such as cauliflower and broccoli) being low in starch, others (such as courgettes [zucchini] and aubergine [eggplant], beets, corn, spaghetti squash, parsnips and turnips) being medium starchy foods, and still others (such as potatoes, sweet potatoes, carrots, winter squash such as butternut squash, pumpkin, peas, swede [rutabaga], and yam, and all grains such as wheat, oats, rye, rice, millet, etc.) being high in starch. Most carnivorous animals need no starch, but the problem is that domesticated cats and dogs (cats to a lesser extent than dogs) are no longer truly carnivorous and so many do require some starch, although amounts required by each would differ. Besides the starch content, some of the foods mentioned are best for Protein Types and some for Carbo Types and can be damaging to the opposite Type. For hundreds of years domesticated dogs were fed large amounts of starch, many having nothing more than grains (meat was considered harmful as it was thought to cause eczema and aggression), and with the advent of complete foods this picture has not greatly changed. The food is still mainly grain based, even though some form of added protein is given. This means that, for many dogs, some largeish amounts of starch are still required in the diet because that is what their bodies have adapted to. This is not the case with all dogs, though, as some don't do well on much in the way of starch. However, those which need starch don't do well without it. Cats have been kept as pets and fed grains and other starchy foods for a much shorter period than dogs, and so some have not yet adapted and would do best on very low amounts of starch, although the species as a whole require more in the way of fibre in their diet than do dogs. This is because a cat's natural diet would be small creatures (e.g. voles and mice) and birds, which have more fur/feather and bone than meat. The dog, on the other hand, is a pack animal and so most of its diet would be larger animals that were brought down by the pack (or the remains of another animal's kill, since dogs are also scavengers) and so most of the bones would not be eaten (being too large and hard), nor would the fur. What else was eaten would depend on each animal's position in the pack heirarchy. They would at times also eat small creatures that they managed to catch, plus anything else (such as fruit) that was available, but these would not be the main part of their diet. But what would be the natural diet of the wolf, as progenitor of the domestic dog, hardly comes into consideration for many dogs, in the Western world at least, after so many hundreds of years of dogs not being fed in that natural way. This would perhaps not be true of breeds from countries where dogs have been fed a more natural carnivorous diet all along. The Husky is an obvious example. Nor is it true of some dogs of Western breeds and crosses, which have still maintained their Protein Type status despite the efforts of their owners. 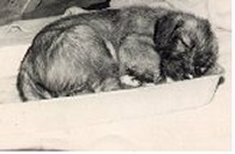 Until recently I had not come across an Irish wolfhound that would have done best on processed complete foods (although I have many times with other breeds); as a breed they appear more to require a meat based diet but it is not always a raw meat diet, nor do they always do well on raw meaty bones. And quite a number do best on low purine proteins or a mix that tends towards more low than medium purine proteins, although there are also quite a number that require high purine proteins as a large proportion of their diet. Elsa came to us with dilated cardiomyopathy which had been diagnosed at the age of three years. She was immediately started on the BARF diet and did extremely well, showing absolutely no signs of any health problems until one day at the age of eight when her heart simply packed up. When Flynn arrived he was also started immediately on BARF and his skin condition, which he had had for two years, just disappeared BUT he developed osteosarcoma. When Lily came she was started on BARF but it did not agree with her and she became quite sick and it was this that made me realise that the diet needs to be fitted to the dog. Besides this, she did best on low energy proteins. I also came to feel that the diet could not have been quite right for Flynn, or he would not have developed osteosarcoma. Our last hound, Ruby, was a Carbo type and the meat content of her diet needed to be from low energy sources (chicken breast, turkey breast). She seemed to do quite well to begin with on raw meat and plain wholemeal biscuit with each meal, but then started to get problems so was changed to home cooked meat with biscuit. She could not have any high energy proteins, such as sardines or heart or liver, at all. She did have a very delicate digestion which was easily upset and could not take most supplements or herbs without getting colicky symptoms and diarrhoea. After a few months on cooked meat and biscuit the digestive system problems returned but she then did well on a commercial moist food which was chicken and rice based, although she could - for the first time - take occasional changes of protein sources such as chicken and tripe and rice, or even lamb and rice. It's not just a choice of raw or cooked or home prepared or commercial foods; it's the choice of the best proteins for each dog, the best of the other foods to give, the balance between proteins and carbohydrates, the amount of starch that would be of most benefit, and whether any supplements would be beneficial and, if so, which ones. I know of dogs whose health has improved enormously when they have been given liver, heart, and other high energy proteins every day and others which have benefitted only when they were taken off all high and medium energy proteins and given only chicken and turkey breast and white fish. I know of some whose major health problems have turned around when the dogs were fed only a commercial complete food which is very high in starch. I have done muscle testing on various breeds and crosses at workshops and been surprised when some have tested strong to what previously I would have considered to be the worst sort of commercial complete food. All this has changed my mind about the relative benefits or otherwise of the various diets, as I have come to realise that there is no diet that is good and probably no diet that is bad in and of itself; it is only good if it is right for an individual dog and bad if it is wrong for an individual dog. So how can you find out what diet is best for your dog? Unfortunately there is no test available and your vet will not be able to tell you. The only way to find out is to ask your dog, either by direct communication or by dowsing or muscle testing. Urban Wolf (http://www.urbanwolf.cc/) - grain-free dietary base mixes for balanced modern canine & feline diets or B.A.R.F. If you give fruit to your dog, do not, under any circumstances, include grapes either fresh or in their dried form (raisins, sultanas) as even a very small amount can lead to acute renal (kidney) failure. The onion family (onions, leeks, shallots, garlic) can also cause major problems and should be avoided, and the Solanum family (potatoes, Bell peppers, tomatoes, aubergines) can be problematic particularly with regard to joint problems. Garlic can be harmful in anything but small amounts and foods that contain herbs should be avoided, as, although herbs have many therapeutic benefits, they are not intended to be ingested at every meal every day and can cause problems if so taken. For example, rosemary can cause fitting. A puppy requires 3-4 meals a day and an adult hound two meals. It is important not to overload the stomach by giving only one meal because of the risk of bloat/gastric torsion (which see), although this disorder is not likely to occur in a dog fed the right diet, although changing the diet too quickly or overdoing gas forming foods such as green beans or dried beans when feeding vegetables as part of the diet could cause problems. Giving too many bones can cause serious problems such as blockages of the digestive tract and impaction of the bowel. This has occurred, for example, when breeders have fed to young puppies ground mixes which contained mostly bones. The amount of fat required in a diet depends on where on the scale between Carbo and Protein Type a dog comes, with Carbo Types requiring very little fat and Protein Types much more. Too much fat for the individual can lead to acute pancreatitis, but what might be too much for one may not be enough for another. Another thing to take into consideration is what sort of feed was given to the animals from which the meat comes. Grass-fed meat is going to be a lot healthier than is grain fed, whatever the individual type of the dog being fed. Dairy products require the enzyme lactase in order to be digested and dogs don't produce lactase past the age of weaning unless they are kept on dairy products all the time. Once taken off dairy products, lactase production stops and, if dairy products are then given to the dog there is likely to be a problem with scouring or some other digestive upset. This is likely to be less of a problem with giving yoghurt, because the lactose content is much less than in milk but yoghurt is still not something to use only occasionally for dogs that are not normally fed dairy products. However, it should be borne in mind that digestive problems can be due to an infection, even though one of the major causes of problems such as chronic diarrhea is an inability in the affected dog to produce enough enzymes or to produce enzymes of certain types, especially those for dealing with milk sugar (lactose) and other carbohydrates. See under enzymes. Another common cause of digestive upsets could be giving supplements the dog cannot deal with. One of the most common nutritional reasons for many ailments, including skin problems and chronic diarrhoea, is an inability to deal with grains, despite so many generations of dogs in the past having been fed nothing but grains. Unfortunately, most of the commercial diets geared towards dealing with sensitivities to foods still contain some grains, rice especially. Even some of those listed as, for example, salmon & potato contain such things as oats, rice, millet, so it is very important to read labels carefully, as a sensitivity to wheat may not be the only problem. Any grain, including rice, can cause problems. For dogs with this grain sensitivity perhaps the best starchy food to use is sweet potato, although some can take ordinary potatoes and other root vegetables such as carrots, swede (rutabaga), etc. If the dog has joint problems, then it is best to avoid ordinary potatoes, as they are part of the Solanum family which can have ill effects on joints. The components of the actual diet are not the only important factors to consider when feeding. There is also what dishes you use, because with some materials the dog is actually ingesting chemicals along with its food. This is particularly the case with plastics which, over time, will flake and become damaged and release chemicals to an ever greater extent. The best materials are stainless steel, glass, or ceramics. Many of those feeding raw meaty bones don't use a bowl, because the hounds only take the bones or large chunks of meat on to the floor to chew or tear at, although a bowl would be used for vegetable meals. 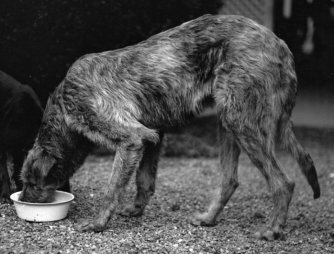 At one time it was thought that eating food from floor level was not a good idea for large breed dogs, as it was considered that caused gulping down of the food and taking in a lot of air, which was thought to be a major cause of bloat/gastric torsion. So it was suggested that to prevent bloat food bowls should be raised to shoulder height and many types of stands were then produced to make this easier to do. However, the latest statistical evidence in the causes of bloat/gastric torsion states that raising food bowls in this way is a major cause of the disorder. However, it should be remembered that bloat/gastric torsion occurred long before anyone thought of raising food bowls and that the raising of bowls was only suggested as a way of avoiding air swallowing, which was thought to be a major cause of the problem at least in some breeds such as the Irish Setter. Over the years, raising feed bowls became more and more common in those breeds prone to torsion, so all that can really be said about its appearing so prominently now in the statistics is that it doesn't actually prevent bloat/gastric torsion, although raising the bowl as high as to shoulder height may well play a part. It might be borne in mind that eating food that is sitting at shoulder height - apart from the odd piece of fruit on a low hanging branch - is not natural behaviour for any four-legged carnivore, but breeds such as the Irish wolfhound are very much longer in the leg in comparison to a wolf and often have to splay their forelegs or even crouch in order to reach a bowl of food on the floor, and this is neither a natural nor beneficial eating position [as can be seen in the picture below], so raising the bowl just to a height (such as level with the knee) at which the hound can eat comfortably while standing in a normal position could be the best thing to do. Of course, with large raw meaty bones a lot of the eating may be done lying down, which is quite a natural position for a dog, as many of the wolf pack would mainly eat while lying down, although some eating would be done while standing up so as to be able more easily to rip meat off the bone. Then there is water, which is seldom even considered as a possible source of problems but can have very strong effects. If you do not have a filter system for your tap water, then consider giving your hounds bottled water so as to avoid all the chemicals and detritus that are all too often present in tap water. Just as there is no one diet that suits all dogs, so there is no nutritional supplement that is required by all dogs. I used to consider that all dogs would need supplementing with a multi-mineral/trace element product such as ConcenTrace but giving it to Ruby made her really unwell as well as giving her scours. It wasn't anything to do with dose, because just a couple of drops in her drinking water was enough to cause upset. One of our earlier hounds, Kore, required three grammes of vitamin C every day or she chewed her legs and feet, but Elsa couldn't take even one gramme a day without scouring. And yes, dogs do produce vitamin C themselves but very often they do not produce enough for their needs. Vitamin C is particularly a stress vitamin, so in periods of stress some dogs may simply not produce enough to cope. A deficiency of vitamin C may show up in various ways such as nervousness, skin problems, lick lesions, inflammation of the gums, ulcers in the mouth or on the body, particularly in areas which take most pressure [such as elbows and hocks], bone growth disorders, immune deficiency disorders, and slow healing of wounds. When our first German Shepherd came to us she had a hard lump on one elbow, about ¾ inches across, which had ulcerated and was an open sore. I started her on Sodium ascorbate, 1 gm twice a day mixed in with her food, and not only did the sore heal but the hard lump gradually diminished in size and then disappeared. When vitamin C is required as a supplement, it is also important to use the best type of supplement for each particular hound. Vitamin C supplements come in a wide variety of forms. The form found in the body is ascorbic acid but this is generally considered to be too acidic and so most of the vitamin C supplements in the shops are in buffered form, which simply means that the vitamin C has been combined with a mineral to reduce the acidity. It is usually calcium ascorbate, but other forms such as magnesium ascorbate and sodium ascorbate can also be found, quite apart from the more complicated forms such as Ester-C and the food-state vitamin C supplements (Higher Nature). However, dogs generally do best on ascorbic acid or, sometimes, sodium ascorbate and cannot properly utilise the other buffered varieties. However, even different makes of ascorbic acid can differ in their availability and the effects they have in some animals. A very common area of imbalance is in Essential Fatty Acids (EFAs), as there needs to be a balance between the two main types, and this is going to differ from dog to dog. In other words, there is no one correct proportion of one type to the other. EFAs are otherwise known as unsaturated fatty acids, and there are two types - Omega 6 (linoleic acid) and Omega 3 (alpha-linolenic acid). Because of their form, EFAs are very easily damaged by heat, light and oxygen, especially the Omega 3s, so they cannot survive the high heat used in processing pet food, although some Omega 6 may survive in a damaged form. Omega 3 EFAs are also known as polyunsaturates. They are called Essential because they cannot be made by the body but have to be obtained through the diet. Nowadays many commercial food manufacturers add them to their foods after processing. Meat contains some EFAs as well as the saturated fats more commonly thought of as being present in meat, although the foods given to the animals has a very strong effect on the amounts (and kinds) of EFAs found in the meat. Grass fed will produce a better balance of fats than will grain fed. Chickens are sometimes fed flax seed in order to raise the levels of Omega 3 EFAs in their eggs and in their meat. Omega 6 EFAs are found mainly in safflower and sunflower oil, but a derivative (gamma linoleic acid) is found in Starflower [borage] and Evening Primrose oils. Starflower oil contains about three times as much GLA as Evening Primrose oil. Omega 3 alpha linolenic acid is found in Flax Seed oil, and derivatives (DHA and EPA) in fish oils. This is not fish liver oil but the oil found under the skin of cold water fish such as salmon and mackerel. Although cod liver oil does contain some omega 3 EFA, it is too high in vitamins D and A to be safe to give in anything but tiny quantities. The reason for giving the derivatives at times is because in some instances a dog may not be able to utilise either the LA or ALA from vegetable oils or flax seed oil. Because of the volatile nature of EFAs, it is extremely important to buy only properly prepared oils. This means that they should have been cold-pressed, excluding light and oxygen during the pressing process, they should be in dark coloured bottles, have a short shelf-life (a Use by date of no more than six months from date of pressing), and be stored in either refrigerator or freezer. Freezing extends the shelf-life safely to a year. Avoid any oils on supermarket shelves (apart from Virgin and Extra Virgin olive oil), that are stored on shelves in health food shops, or that have been overly processed, which simply means that most of the goodness has been taken out. To many people, dry or scurfy skin on their dog may indicate a lack of oil, so they buy a bottle of Sunflower oil or even just "cooking oil" from the local supermarket and add a tablespoon or two to the dog's commercial food. This is most likely to make matters worse for several reasons, the first being that Sunflower and "cooking" oils contain mostly Omega 6 EFAs, which is often the kind of which the dogs will have too much. Being in the supermarket, both types are likely to have been produced using various chemicals and heat treatments and so contain only damaged EFAs even before they are put into clear glass bottles and stood on the shelves in full light and the warmth of the supermarket. And that is apart from the amounts of chemicals that will still be in the oil from the processing. The only oils that are safe to use in cooking are Extra Virgin (for preference) or Virgin olive oil, or Avocado oil, or coconut oil. However, there can be just as many problems from constant feeding of, for example, flax seed, especially if the flax seed is purchased ready ground. Many dogs cannot utilise the oil from flax seed and, even if they can, the seeds should be ground only just before feeding as otherwise the Omega 3 EFAs will be damaged. In my opinion the only use for the large bags of ground flax seed that can be purchased is as a doorstop. Other nutrients are also important, especially minerals which are required for enzymes to work and for vitamins to be utilised by the body. Because of the depletion of the soil through modern farming methods over the past fifty years especially, food no longer contains the range of nutrients, especially minerals and trace elements, required for health. But, although minerals and trace elements are extremely important, the available supplements cannot always be dealt with by some dogs. Magnesium supplementation may be particularly important in cases of heart disease, and could be helpful if given when Atrial fibrillation first starts or is first diagnosed. Antioxidants can also be helpful in cases of heart disease, Co-Enzyme Q10 having been found to be particularly useful in the human field, but Vitamin E (in natural tocopherols) is also very useful. Some dogs may at times require almost any of the vitamin or mineral supplements that are available, depending on their state of health and individual needs but the same sort of problems can be caused by giving supplements that cannot be dealt with by the body or that are surplus to requirements as can be caused by giving the wrong basic diet. It cannot be said that every dog requires so much a day of calcium or so much a day of any nutrient; it all depends on the individual. Some amino acid supplements can be helpful in some cases, particularly in some cases of heart disease. Going by present knowledge, the amino acids most likely to be required are carnitine and taurine. Amino acids are the building blocks of proteins. Meat generally contains all the essential amino acids but some dogs have been found to be lacking in carnitine or taurine which is presumed to be because either the food they are given lacks these, the dog cannot utilise what is present in the food, or the dog has a particularly high need for them which is not met by its diet. Other protein sources, such as grains and soy, do not contain the full range of amino acids. Enzymes are catalysts. They bind temporarily to one or more of the reactants of the reaction they catalyze. In doing so, they lower the amount of activation energy needed and thus speed up the reaction. For example, the enzyme Carbonic anhydrase is found in red blood cells. It enables red blood cells to transport carbon dioxide from the tissues to the lungs. One molecule of carbonic anhydrase can process one million molecules of CO2 each second. The body uses enzymes to digest the food eaten. Enzymes to perform this task come from the food you eat (food enzymes) and internally from the digestive organs (digestive enzymes). But when food is cooked or processed at temperatures greater than 118° F, the enzymes in the food are destroyed. To compensate for these lost food enzymes, the body must work harder and create more digestive enzymes to fully digest the food. Every living creature has inherited a certain bank account of enzymes and, if the food they eat contains little or nothing in the way of enzymes, then they are constantly drawing on their account in order to digest the food and the account becomes depleted. Enzymes are needed for every process in the body and the body puts digestion of food at the top of its list for enzyme production so that, if it is constantly producing enzymes for digestion, it cannot be producing enzymes required elsewhere for maintaining healthy tissue, cleaning up toxins, etc. When the body has to produce all the enzymes required for digestion, the pancreas is required to perform this task instead of its normal work as part of the immune system. Hence the downward slide into illhealth and shortened lifespan. Raw food contains enzymes, cooked and processed food does not, but not all dogs will do well on raw food despite the enzyme potential. However, supplementing with enzymes can be done for any dog not on a raw diet, and may be of help to some dogs that are on a raw diet but require a larger intake of enzymes than is found in their food. Raw foods generally contain enough enzymes for digesting those foods (although there are an ever growing number of enzyme inhibitors in our world) but nothing left over for further processes. So dogs with depleted enzyme reserves (i.e. with health problems) may benefit from enzyme supplementation, either with food (to help with the digestive process) or between meals (to help with other processes). There is also the point that enzymes require vitamins and/or minerals in order to function effectively. Vitamins - at least, the water-soluble vitamins - are known as co-enzymes and minerals as co-factors. Vitamin C, for example, is a co-enzyme for a number of enzymes, including two which help maintain the structure of collagen, which is the reason vitamin C is so important for bone and joint health. The mineral Magnesium, for example, is involved in more than 300 enzyme systems, including the synthesis of fats and proteins and for glucose metabolism. There is a difference between a food allergy and a food sensitivity, but it's probably simpler just to call any reaction to food an "allergy" since that is how most people think of it. A dog can be allergic to anything it ingests, although some foods are more likely to cause problems than others. Some times a dog may be allergic to a food in a cooked or commercial diet and be able to eat the same thing raw without a problem. It also needs to be borne in mind that reactions may well be wider than simply to foodstuffs. An allergic animal may well have contact and/or inhalant allergies as well as food allergies and this can make it difficult to deal with the problem, because removing a food that the dog is reacting to may not remove the symptoms because they are in part due to some other allergic reaction. - as allergic reactions show that the immune system is over-reacting and therefore cannot be in balance. http://dogtorj.com/?s=food+intolerance+in+pets A page with articles on Food Intolerance in Pets by Dogtor J.